RadioDNS demonstration from Italian public service broadcaster RAI at Prix Italia event. Because RadioDNS is an open technology, allowing anyone to test, trial and produce new RadioDNS services, the RadioDNS Project Office don’t always hear about some of the trials going on. There’s no licences to sign or payments to make, after all, and no requirement to let us know what you’re doing with the technology. 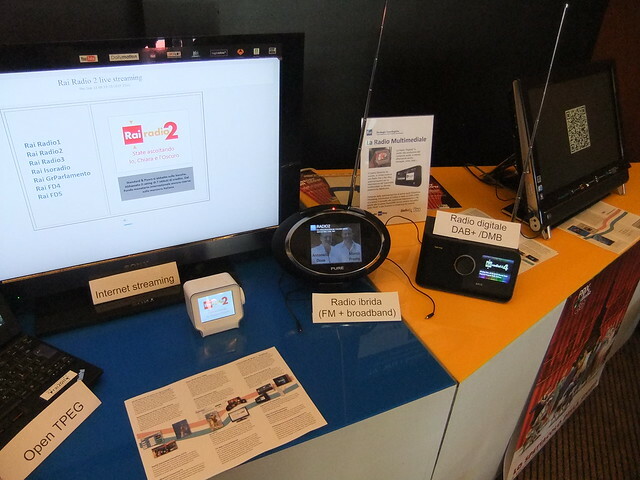 Imagine my surprise, then, when attending the Prix Italia event at RAI, the Italian public service broadcaster, to see a RadioDNS demonstration in a prime position right inside the front door. Nestling close to the old transistor radios in the radio museum was a display demonstrating radio’s hybrid future – DAB+ (displaying DAB’s broadcast slideshow); Hybrid FM, displaying RadioVIS/FM via RadioDNS; and internet radio on a little Chumby device. It made my talk – about how RadioDNS works, and demonstrating RadioTAG, RadioVIS and RadioEPG, including our new service-following – all the better to be able to point interested people directly outside for a live demonstration. We’re delighted to have RAI as a supporter, and it’s wonderful to see such a vibrant and interesting display that clearly demonstrates that hybrid radio, through RadioDNS, can enhance the user experience across different platforms. Want someone from RadioDNS to talk about our project at your event? Get in touch.